The DeKalb County School District (DCSD) students, teachers, staff and community members celebrated the official opening of one elementary school and the groundbreaking of another in March 2018. 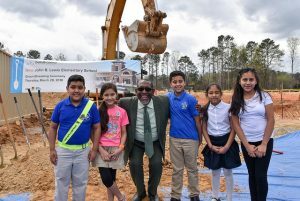 Rockbridge Elementary, located at 445 Halwick Way in Stone Mountain, held its official ribbon cutting ceremony on March 16. 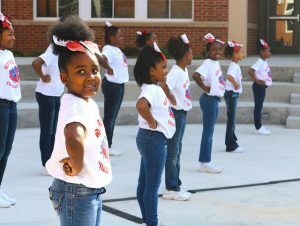 The event featured student performances as well as statements from school and district officials. Rockbridge shares Fernbank Elementary and Barack H. Obama Elementary Magnet School of Technology’s new, state-of-the-art design, which features collaborative learning spaces, flexible fixtures to suit student needs, and improved security measures. Green announced on March 16 that The Associated General Contractors of Georgia awarded Rockbridge Elementary first place in its category in the Build Georgia Awards Program. Principal Derrick brown thanked Dr. Green, central office staff and the Board of Education for allocating the resources to make the new facility possible. “Our school’s aspiration is to prepare every student for higher education, careers and community service. We aim to instill values of hard work as well as giving back. 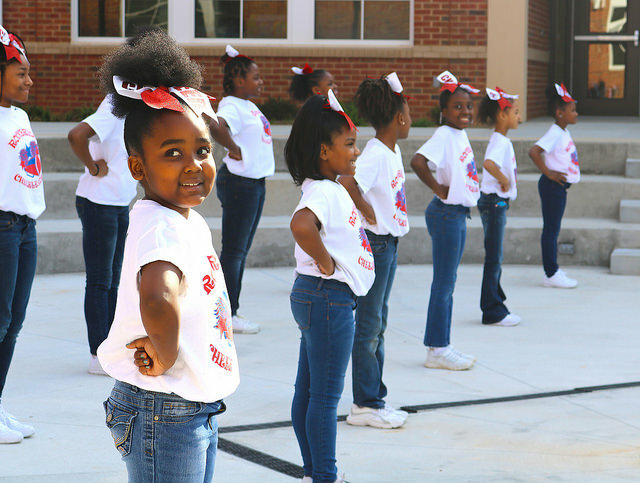 Our elementary schools are the foundation for the remainder of our students’ education. If we help them build a solid foundation here, they will rise to the challenges they face academically and professionally to pursue their dreams,” said Brown. Guests also enjoyed an instrumental flute performance from musician Arthur McLenton, a demonstration from the Rockbridge Cheer Squad, songs from the Rockbridge Honor Choir as well as teachers Dr. Donna Newsome and Brandon Marshall. Students Kaydence Redmond, Dashyre Altidor, Chantayvia Beckett, Jevon Williams and Aaliyah Walker also shared an inspirational poem promoting positivity and tolerance. Region 3 Superintendent Rachel Zeigler concluded the event with remarks about Rockbridge’s history and continued heritage of success. Less than two weeks later, on March 29, the community joined DCSD in celebrating the groundbreaking of the new John R. Lewis Elementary, which will be located at 2630 Skyland Drive NE in Brookhaven. 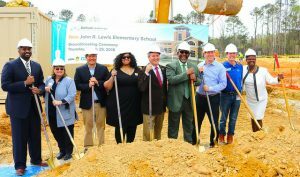 The new John R. Lewis Elementary will also feature collaborative learning spaces, flexible fixtures, security improvements and abundant natural light. The event featured remarks from DCSD Superintendent/CEO R. Stephen Green, John R. Lewis principal Julie Brown, Brookhaven mayor John Ernst, Region 1 Superintendent Sherry Johnson, as well as DeKalb County Board of Education members Vicki Turner, Marshall Orson and Jim McMahan. Principal Brown said John R. Lewis is built on five pillars: targeted instruction, bridging gaps, communicating with the community, improving the school climate, and working in partnership. Mayor John Ernst said it is important to remember the overall aim and goal of the new facility: educating children. Board members Vicki Turner, Marshall Orson and Jim McMahan also made remarks to celebrate the joyous occasion. Attendees also enjoyed an inspirational poem from two John Lewis students as well as a recorder performance.